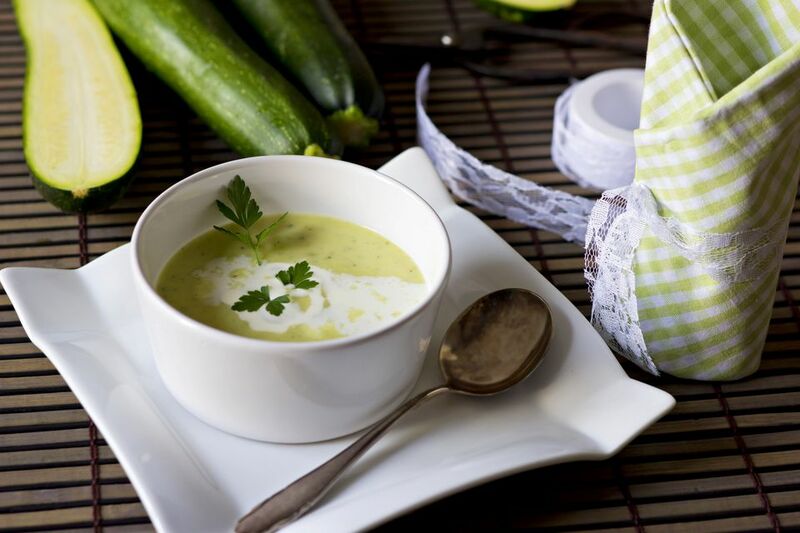 Cold zucchini soup has a wonderfully smooth, thick texture simply from the amount of zucchini, as there are no starchy thickeners in sight. Make it creamier with the addition of cream or yogurt, if you like. It's perfect for using up prolific zucchini, and makes a delightfully cooling meal to boot! This is a great chilled summer soup for hot nights. Heat a medium pot over medium-high heat and add oil or butter. When the oil is hot, add the onion and salt. Cook, stirring occasionally, until onion is translucent and tender, about 5 minutes. Meanwhile, trim and chop the zucchini. Add zucchini and broth to the onion. Raise heat to bring to a boil then reduce heat to maintain a steady simmer and cook, stirring occasionally, until zucchini is very tender, about 15 minutes. Put pureed soup in a large bowl or sealable container. Cover and chill until cold. When ready to serve, stir in cream or yogurt, if using, and add salt and pepper to taste.